Making American Girl Doll Clothes is easy with this free sewing pattern. It is an easy doll dress to sew and can be made in less than an hour, really even less than that. Making doll clothes can be a great beginner sewing project! 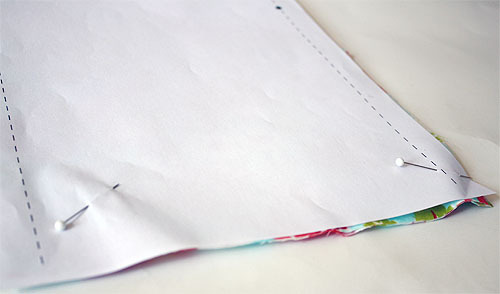 If you are looking for more easy ways to learn to sew be sure to check out my practice sewing sheets. They are a great way to become familiar with the sewing machine. Then you are ready to sew this doll dress. This dress is perfect for an 18″ American Girl doll, or any 18 inch doll. Doll dress patterns don’t use much fabric, so they are a great way to use up leftover fabric. If you have a baby doll you might also like this doll diaper pattern. It too is a free printable sewing pattern. We are ready to get started on our easy doll dress! You won’t believe how quickly this dress goes together. It is just like a pillowcase dress. 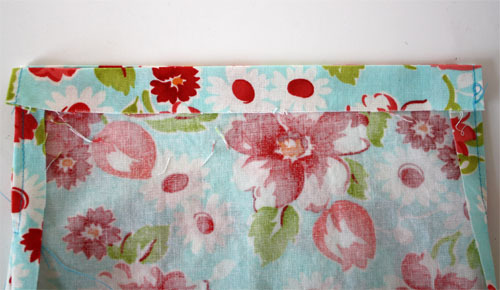 Do not cut pattern, use the complete outside of the edge of the 8 1/2″ X 11″ piece of paper to cut out the fabric. Mark dots onto fabric. With right sides together sew together side seams, from dot to bottom on each side. The open area creates the armhole. Press open seams. Next sew close to the edge of the top side opening. Start at the top, go down around bottom (just below where side seam started at the dot) and back up. Repeat this on the other side of the dress. Turn top down 3/4″ and press. Do this on each side of the top of the dress. 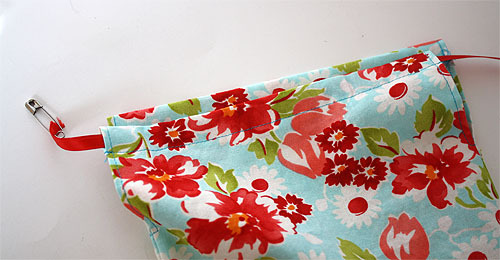 Sew across the top on each side 1/2″ in from the fold, creating a pocket for the ribbon to slip through. Repeat on the other side. 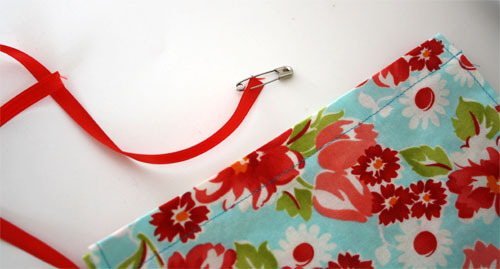 Place a small safety pin on a ribbon and slide it through the pocket. Start on the far right front then through the back. If the pin gets stuck in the side seams open up the pocket with a pencil and try again. 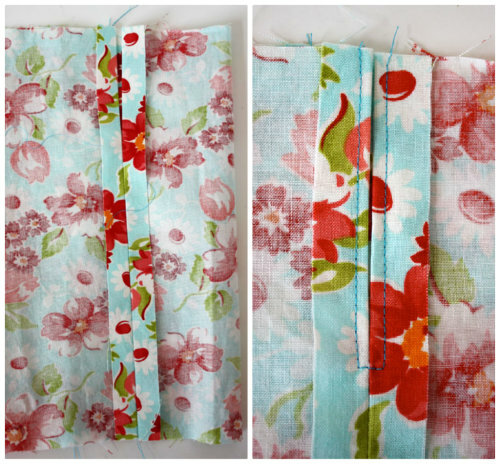 Turn the bottom of the dress under a 1/4″ to 1/2″, press and edge stitch all the way around. Put the dress on and tie a bow. 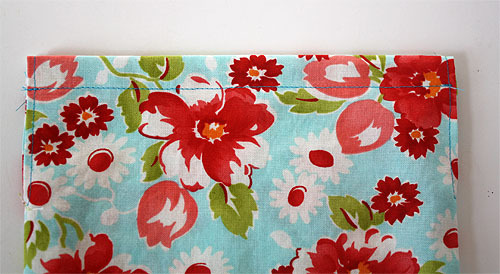 If you prefer finished seams, serge or zig-zag around the outside edge of pattern pieces before beginning. If you feel this dress will be washed at some point be sure to prewash the fabric. I am a fan of the disappearing marker to make markings on the fabric. There you go, a simple doll dress pattern that you or your child can easily make! Hope this sewing pattern helps you whip up a bunch of American Girl Doll clothes! 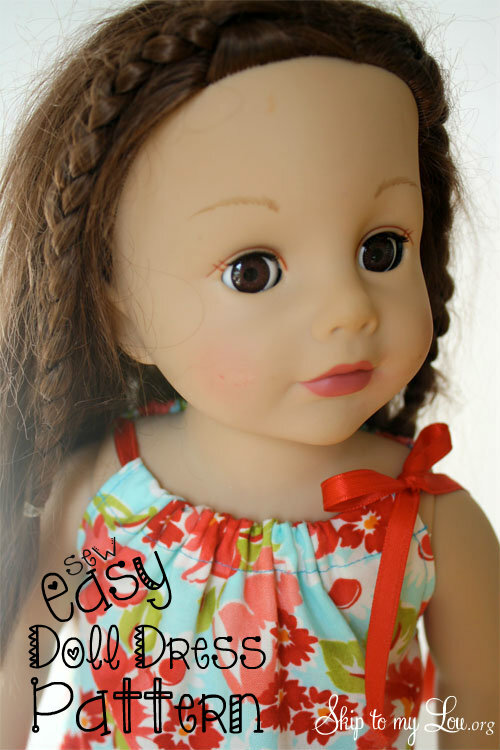 I am always on the hunt for easy doll clothes patterns–so much cheaper than the real thing! If you crochet, try this doll scarf. Ellie is my 6 yr old granddaughter. We are going to sew together. But I only see girl doll patterns. She has a brother and a boy American doll?? We need boy patterns too!! Don’t leave the budding boy tailors out! Lol. Thanks for listening and all that you do! Do you know the name of the doll you use as a model in this tutorial? I've always thought she looked a lot like my granddaughter will look in a year or two and would love to find one. I would appreciate an email answer if possible. Thanks! Love your work. This is so darling! I just want to thank you for your encouragement to teach my 8 year old granddaughter to sew! She is a creative girl and loves projects, sewing is perfect for girls like her! I love this so much, this is why I do this! Thank you. My granddaughter is into American Girl Dolls. I am looking for simple patterns she can do by herself. Hey! was looking to make this dress for my niece, she has a 14inch American Girl Doll Wellie Wisher doll. would you know what I should adjust to make it fit for 14inch doll? Oh no! Please tell me where in the instructions I need to add more details. I am sorry about your fabric. Hi Mariann, You are so sweet! Yes, I am still working on it! Cindy, this is adorable! My caught recently got a Hello Kitty kids sewing machine, and we've been looking for some projects that would keep her interest. I KNOW she would love to make a matching dress for her and her doll! Love this pretty flowery material too! Thanks for sharing! Thanks for the pattern, I'll be able to start making some Christmas gifts now for my grandaughter. So glad you liked it Debbie. My granddaughter is having a American Girl Doll Birthday Party. I can not attend -- so she wanted a sewing date with me. This will be the perfect little outfit for her to make. And it goes well -- we can make dresses for party treats for the attendees! Thank you so much. And may God bless! I am teaching a young lady how to sew and thought these would be perfect to sew for her dolls and little sisters dolls. Thanks. My 5 year old just made this for her new doll and it came out amazing!!! Thank you so much for this pattern! Kay: Why not use this pattern and jazz it up with lace and sequins. Get a remnant, something suitable for evening wear. Put in a fancy ribbon. Thank you so very much for this pattern and for the tutorial. I'm a visual learner and so I appreciate the extra time you took for pictures. Ever think about doing video tutorials? I just made one for my daughter for Christmas. Fast and easy! Thank you! I haven't seen one. Let me look around a bit. Hi, is there anywhere that I can find a simple pattern to make a dress for a 5 1/2 inch bisque Nancy Ann doll? Thank you. How perfect! Thank you for sharing. My granddaughter who is 2yrs. old will love some new dresses for her doll. I made it first, then my 7 years old daughter made 2! Thanks for sharing it. I am having sewing camp for 2 days with my 10 and 7 year old granddaughters. They learned how to sew straight lines, then applied that to the doll pillowcase dress. They made 2 doll dresses and the 2nd one was even better. Now they are ready to make their own pillowcase dress. Thank you so much for this pattern! I adapted your tutorial to a smaller version for my 3 year olds crocheted doll and linked back to you in my post! With how easy this dress is, I can make a few for this much loved doll! Wonderful tutorial - we made adjustments to fit my granddaughters 14" Hearts4Hearts dolls & made 3 dresses today. later! - free-doll-clothes-patterns is an interest of mine and and your "Easy Doll Dress To Sew | Skip To My Lou" article is without doubt fantastic work. keep up the great work, I'll check back again soon! Just made this dress with my 5 year old and it was great! We did it in about 30 minutes, and I'm not an expert sewer by any means. My daughter was even able to do much of the sewing since it's a lot of straight stitches. Looks great on our doll - thanks!! I just want to say thanks! I've never sewn a day in my life and even though the dress didn't come out as cute as yours, my daughter is thrilled with it, and I'm proud of myself! I've been way intimidated to sew, and even with a screw up and a start over, I was able to do it! Thank you so much for sharing this pattern! Can't wait to make this!! can you tell me about the doll. That is the prettiest doll I've ever seen, I'd love to find it for my daughter. Can you tell me the brand and the name and where you got it? Also, the pattern is lovely. Clever and easy. Glad there are people who can create these things for others to enjoy. Hi RF, It is a knock off...and I am sorry I don't remember the name. I thought it was a discontinued Zapf, but I am not sure. I know I paid less than $50.00. I will see if the doll has any markings. I can't get the download links to work to get the pattern. The download was hard to see thank you for letting me know. I have now fixed it. Hi, Noel! The dress is sewn straight across. I think it only looks like a scoop neck because the ribbon is tied loosely and the fabric is gathered more in the middle front. If you play around with it on the doll you'll be able to achieve the scoop effect. Had a question. Sewed this for my niece but I could not get it to turn out like the picture. The top just comes straight across with no scoop neck. What am I doing wrong? I like how easy this pattern is! This really is a fabulous project, Cindy! I shared two dresses that I made with the pattern on my blog today: http://www.stampgoodness.com/2013/02/a-most-unexpected-project-featuring-tea-for-two-from-stampin-up.html and I know we'll be making more of these in the future! Thanks so much for sharing this idea! both in length and width. Your photos are wonderful!!! Blessings to you!!!!!!! Thank you so much for the great tutorial! My girls and I (and some of our friends as well) followed your tutorial today and gave our little girls their first sewing lesson while we made these dresses. They were a big hit and my daughters are already asking if they can sew again tomorrow. This is adorable! The download link for the pattern isn't working. Can you point me in the right direction, please? Just used your lovely pattern for a little dress for an Australian Girl, and it is wonderful. Thanks for a great & free tutorial. For the lady who wanted to know about American Girl Dolls without teeth. Madame Alexander Dolls have no teeth and besides that look just like American Girl Dolls, but I like them better because their shoulders and upper arms are not made out of material like American Girl Dolls so look cuter in sleeveless dresses. I bought my granddaughters, me, my daughter and daughter in law all Madame Alexander Dolls through Avon. They don't sell them any more but I have seen them on Ebay. They seem to be like the Generation dolls from Target and Walmart, but not sure. Thank you! I am a beginner sewer and made this dress for a little girl's American Girl doll. Great, EASY instructions for someone like me who knows next-to-nothing about sewing. For everyone unable to download the pattern, it had me stumped as well. You have to click on "Free American Girl Style Doll Dress Pattern" and NOT "Download". Can't download the doll dress pattern. I have Adobe Professional 8 and I also downloaded the PDF Reader on your page. However, the 'download' button is not accessible. Can you help me? Thanks for sharing this. I hope to make these with my girls! Thanks for much for this cute and EASY dress! I am in the process of making some American Doll clothes for my granddaughters' birthdays in September. I'd love to try this but I can't get the download button to work! Thanks for the great idea! Thank you for the instructions, my nieces will be so happy once I get around to making them this little dress. Can you tell me what doll is in the picture, my daughter now wants an American Girl doll without "teeth" and I'm not sure if the pictured doll is an our generation from Target or one she saw in A.C.Moore. Thanks! Very quick and easy! I made 2 dresses from one fat quarter. One for my daughter's doll and one for a friend's. I overlock stitched around each 8.5 x 11 prior to sewing them together to prevent raveling. I also reinforced under the arms as I was sewing by back stitching a time or two at the 'dot' on the pattern before continuing back up the arm hole. Love the pattern. Thanks for sharing! 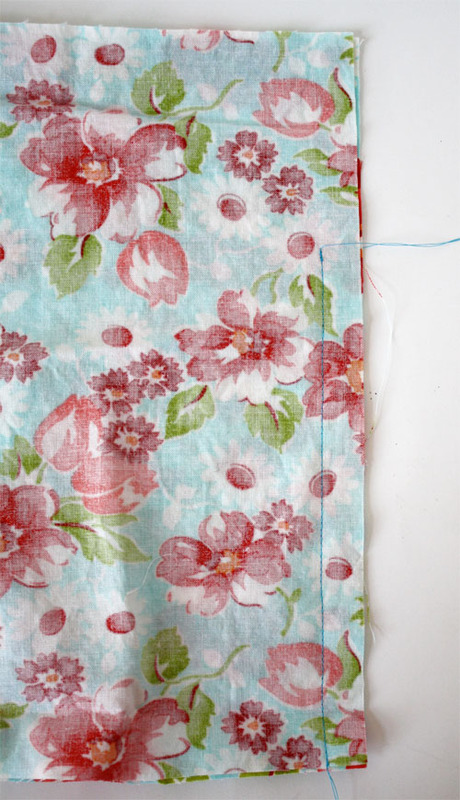 The fabric you used for your tutorial is too cute! My daughter has been wanting to sew something for her doll. This is perfect. this is adoreable and I can just enlarge the pattern to make a matching dress for my neice!! Love this little dress. Maybe someday I will have granddaughters! Thanks! We have a fundraiser in Feb and I've got a lot of FQs. I'm starting right now! Thank you so much for the step by step instructions and photos. My daughters have been begging me to make there dolls a dress. Now I can yay!!!! Thanks for this pattern for the doll dress. I am sure with help ,my granddaughters will be able to make new dress for their dolls. Matching pillowcases dresses are in the future.